For most of church history, the book of Revelation was read as a prophecy which was being fulfilled at the present time. In fact, Historicism was the only method of interpreting Revelation through the Reformation, including Luther himself. 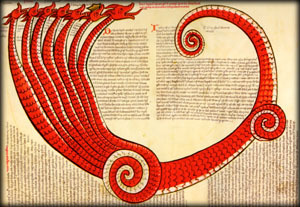 The only writers who attempted to develop a method other than historicism prior to the early nineteenth century were Roman Catholic scholars, likely motivated by the Historicist criticism of the pope as the antichrist. In Historicism, the symbols of Revelation are interpreted as predicting the course of church history from the time of Jesus through the Second Coming. An common example of this is taking the seven churches in Revelation 2-3 as symbols of various eras in church history. For example, the first church, Ephesus, is usually taken as the post apostolic era, ending with the Nicene council in 325. The last church, Laodicea, is “lukewarm” and faces harsh judgment. This becomes a symbol of the “present church” which needs to recommit itself to the gospel in the light of the soon return of Jesus, who is standing at the door (Rev 3:20). The seven seals, trumpets and bowls are interpreted in detail as references to specific historic events leading up to the time of the writer. Usually the writer declares that the fifth or sixth bowl has been poured out and the time is nearly at hand. The most serious problem for the historicist position is that none of the historical identifications could be proven, most would be considered obscure and anachronistic in the light of the 21st century. The numbers of days found in Revelation were taken as years, so that 1260 days became 1260 years, allowing the interpreter to calculate the approximate time of the end. The rise of Islam was frightening to the Christian West, so it was easy to identify them with the hoards of demons rising from the Abyss, but other details were more obscure. The “beast” and antichrist is almost always the Roman Church which suppressed the truth. The Waldensians and Albigensians (the Cathars) were often associated with the two witnesses because they were seen as anti-papal. By the early nineteenth century, historicism was running out of new ideas. The combination of several spectacular failures in predicting the return of Jesus and the rise of rationalism doomed historicism to a footnote in modern discussions of interpretive methods. While the method gave the book an evangelistic edge, it was too often used to condemn one’s enemy (religious or political) as the anti-christ. But this evangelistic benefit is meaningless if the book of Revelation is not a prediction of minute details of the present era. There were two reactions to the historicist position among some Protestant writers – preterism (Revelation is all past) and futurism (Revelation is all future). Because both of these reactionary movements had precursors in Catholic theology, many Protestants who began to view Revelation as either entirely past or entirely future were viewed as giving aid and comfort to the “Papists” and were accused of not holding firmly to reformation truth. Nevertheless, historicism remains on the fringes of biblical studies and preterism and futurism have become standard ways of reading Revelation. It is interesting to see the importance this view once held in church discussions on the book of Revelation, especially by dispensationalists. It is not something that one hears much about today. It seems to me that most people take a Futurist view of the book. I think that it is safe to say that this view, in its strictest form, is not correct. Neither is the preterist. I think that the letters at the beginning of the book are for real churches that existed at the time the letter was written. But a majority of the book should be taken as a prediction of future events. To lean too far to one side or the other is to miss important elements in the book.